Anticipating high demand for National Park vacations, Vacations By Rail expands its 2010 independent and escorted rail tour offerings giving customers the largest selection of United States National Park rail vacation options. "Combining spectacular train routes with 'America's Best Idea,' U.S. National Parks, creates a uniquely American experience. Rich history, awe-inspiring scenery and National Treasures are what people are craving," said Todd Powell, president of Vacations by Rail. "and with Ken Burns' new National Parks documentary, high demand for National Park vacations is sure to be expected." Due to the expected demand for U.S. National Parks programs, Vacations By Rail is taking advanced reservations on 2010 programs. Those people interested in learning about Vacations By Rail's expanded National Parks vacation options can simply go to Vacations By Rail's website or call 1-877-929-7245 and speak to a rail specialist. 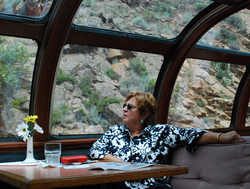 Vacations by Rail is the leading seller of rail travel and tours in North America and the trusted authority on rail vacations. Travelers can choose from the largest selection of independent rail vacations, escorted rail tours, luxury rail journeys in North America, Europe and beyond. Vacations by Rail also provides virtually every European rail pass and ticket to meet customers European travel needs. For more information on Vacations by Rail and the company's products, email marketing@vacationsbyrail.com or call 1-877-929-7245.